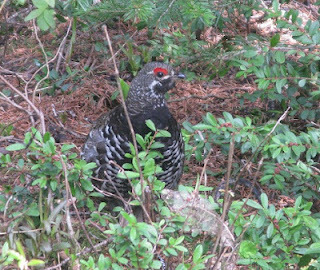 A Victoria Birder: Target Birding, Okanagan Style! My wife and I decided to take advantage of the Canada Day long weekend by heading east, and spending three nights in Penticton. Despite the number of years I have been birding, I was still missing a number of "Okanagan Specialties", and I had previously spent as much time birding in the Washington State Okanogan as I had on our side of the border. I was hoping to correct this and made up my list, checked it twice, and sent off emails hoping for hints to find my targets, which ended up numbering 12. We were in high spirits when we rolled off the first ferry on Saturday morning but things started to look bad when we passed Hope and the skies opened up in a big way. Luckily, things cleared when we entered Manning Park and started birding. Lightning Lake was quiet, so we moved up to Strawberry Flats, hoping for a couple of specific species. We heard Barred Owl and three Dusky/Sooty Grouse calling, and had a smaller woodpecker fly over, though we couldn't get a good look. Walking around the trails and up the closed road beyond the parking area, we didn't turn up much else, but on the way back a small shape caught my eye, about 60ft up the Poland Lake trail. Binoculars revealed my first target of the trip, and a lifer! This male Spruce Grouse was not only very accomodating as it let me approach, but it walked the last bit toward me before lunging at my camera and then my hand! It made quite the show of pumping its tail and grunting at me, and after a couple of pictures we left it alone and continued to the Spruce Bay part of Lightning Lake, where we headed down the Skyline Trail. Despite my falling off a log, in slow motion it seemed, and incurring a few bruises and cuts while trying to track down a soft tapping, we kept going and located target two, 2 separate Three-toed Woodpeckers, a Canada bird. Princeton turned up a good number of birds, including Ruddy Ducks and American Coots with young, a treat for an Island Birder. Slow birding followed us to Penticton, and I ended the day with a trip down Max Lake Rd, where I picked up target three and another lifer, Common Poorwill. Sunday morning found us up and out early, with my wife sleeping in the passenger seat (she had caught some kind of bug, and spent most of the weekend sleeping in the passenger sear). We headed up Shuttleworth Rd headed for Venner Meadows, hoping for another dark woodpecker. Despite over three hours of searching, we only managed to find the usual suspects, including Red-naped Sapsucker, Evening Grosbeak, Clark's Nutcracker, etc. Vaseux Lake treated me better, and I managed to find Chukar and Rock Wren (Canada birds) in very short order. The wrens were singing from many exposed rocks, and the Chukar were hopping from rock to rock across the base of the cliffs. River Rd, north of Oliver, also treated us well, with views of Black-chinned Hummingbird (Canada bird) and Yellow-breasted Chat and Bullock's Oriole singing from the shrubs. A trip down to Km10 of Camp McKinney Rd produced my first Gray Flycatcher for Canada. A valley favourite, Road 22, was also very birdy in the afternoon, turning up target number eight of the trip, a Veery singing from an exposed perch (BC bird). The ever-present Bobolink were very evident, as were Lazuli Buntings, Grey Catbirds, Yellow-breasted Chats, and others. A detour through White Lake on the way back to Penticton turned up little except an early Greater Yellowlegs, but did provide some nice scenery, though the water had disappeared from the lake. Monday, our last full day in the Okanagan, started with a return to Venner Meadows and a 4km walk. As the day before, Black-headed Woodpecker was nowhere to be found. Very vocal and active Cooper's Hawks and a Red-naped Sapsucker nest with young were nice consolations, as were the Pine Siskin and Red Crossbill numbers. We had some time to kill before going after the next target, so we detoured up the Naramata Bench and visited a couple of favourite wineries - Therapy Vineyards and Poplar Grove. At Therapy, I managed to snag a couple of bottles of their 2011 Artist Series Riesling-Kerner, a spectacular wine which is unfortunately only available in their shop, and soon to sell out. I didn't fare as well at Poplar Grove, where I only managed to get my name on the list for a shot at their 2009 Cab Franc when it is released in the fall. Post-wining, we made our way up to Casa Cannings, where both Rufous and Calliope Hummingbirds were holding court. From there, Russ led us to a much and long-wanted lifer, Flammulated Owl. Apparently this individual bird is likely the source of most of the life ticks in British Columbia. Not a bad way to end the day. I headed back out to White Lake very early on Tuesday morning, hoping to pick up a couple of last-minute birds before heading home. Despite the mild weather and no rain (which had been on and off all weekend), there were few birds active. Brewer's and Vesper Sparrows sang from the sage, Eastern and Western Kingbirds kept watch from the powerlines, and a family of California Quail bobbled across the road. Finding no new birds, I returned to Penticton, packed the car with our luggage and my wife (thankfully she doesn't read this blog!) and headed south towards Osoyoos with the aim of hitting a few fruit stands and a few birds. The dark sky above us was split by lightning and the rain made it easy to pull over and seek refuge among endless cherries and bottles of Ogopogo Hot Sauce, both of which came home from me. 40km and 8 fruit stands later, we happily encountered a break in the weather, in the exact vicinity of Nighthawk Rd and the Chopaka Border Crossing. I had tried to bird Nighthawk on Sunday, but the rain was heavy to begin with, and only increased in intensity every time I got out of the car. Tuesday allowed me to have my wife drop me off near the the border crossing, and head down the road for a nap. The sagebrush along this road has always been a favourite of mine, having turned up Clay-coloured and Grasshopper Sparrow for me in the past. I had a different bird in mind as I walked up the road. Trying to filter out and listen through the endless song of at least two dozen Western Meadowlarks, plus calling sparrows and Black-billed Magpies, I finally heard what I was waiting for as I approached the wrought iron ranch gate near which my wife had decided to park. Scanning the tops of the sage I saw nothing, until I turned my attention to a small deciduous tree in the middle of it all. Perched near the top was the singer, a male Sage Thrasher! I had considered this new for Canada bird highly unlikely, and had not even included it in my target list, but there it was, singing away in plain sight! We were first alerted by a begging juvenile. When we tracked the bird down, we saw a sight that left me puzzled. 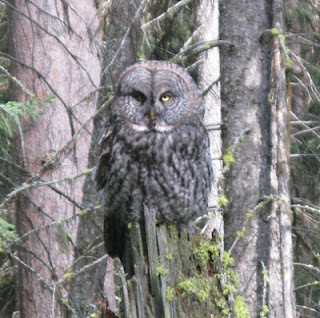 The recently fledged Great Grey Owl was attempting to beg food from an adult Barred Owl! It would move from branch to branch around the Barred, and occassionally would land beside it on the same branch. Bizarre! Eventually we tracked down one adult while another called in the distance. A couple of pictures, and we left them, hoping the real parents would step in for the negligent Barred. All in all, we found 10 of my original targets plus one big bonus bird. Of these, 4 were lifers, 6 were Canada birds, and 1 was a BC bird. Not a bad trip, though my next target trip will have to be a little further north! You had obviously had a great trip! How many species did you see?